Just a sec. Gotta wake up the lions. Best to be slow and gentle when waking up a sleeping lion. Ever wish you had a short summary of all the essential A&P charts, diagrams, and tables in your pocket? Now you can! Find important anatomy and physiology principles at a glance! A full-color, pocket-sized reference, Mosby’s Handbook of Anatomy & Physiology makes it easy to look up A&P facts and concepts fast. Quick-reference tables summarize key anatomy and physiology information, and hundreds of illustrations show how the body works including skeletal, muscular, and cardiovascular systems. Written by expert A&P authors and educators Kevin Patton and Gary Thibodeau, this compact review is your go-to reference whether you’re in the classroom, in the lab, or on the job. The handbook is also useful in other professions such as insurance, art illustration, law enforcement, fashion, fitness, and business, when knowing about the structure or function of the body (or its parts) is helpful to getting the job done right. A body systems organization makes content easy to find and easy to study. Hundreds of high-quality, full-color drawings and photos provide a quick reference to important A&P facts and concepts. Quick-reference tables summarize key anatomical information and physiological concepts for easy lookup and retrieval. Compact size makes this book easy to carry wherever you go, from study session to classroom to lab. Thumb tabs allow you to locate material easily. 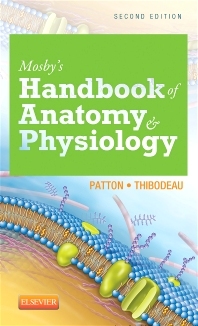 Check out Mosby’s Handbook of Anatomy & Physiology now!